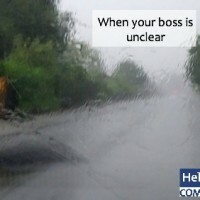 What can you do when your boss isn’t clear? How do you lead others in that situation? I also review an article from Harvard Business Review about the top 10 complaints from team members about their leaders when it comes to communication. Finally I share about how to work with a difficult team member – someone who seems to be undermining your projects. The Top Complaints from Employees about their Leaders – Harvard Business Review article from the Thought Leader segment. Recording: [00:00:00] Becoming a Geek Leader Season 2, Episode 3. Tom: [00:00:07] Have you ever had one of those really annoying customers who always seems to be looking to start an argument? [00:00:13] Have you ever had a team member who just couldn’t let go, and delegate work, but was always complaining about being buried? [00:00:21] I’ve been there, and I know how frustrating that could feel. I also know these things don’t generally get better on their own. People need help learning exactly how to communicate, delegate, manage conflict with others, and plan more effectively. Now you know it would be great if you had a simple plan to address those needs, but you’re crazy busy too, right? [00:00:45] That’s why I created the Geek to Great 101 program. [00:00:50] It’s a simple system, designed for you to take a portion of your already scheduled team meetings to play a video for your team, ask a few questions from the leaders guide, and your team members will be able to fill in their own personalized action plan. It’s a great way to put a simple, professional development program in place. Your team members will be able to share their plan with you, and you could help them actually do it. [00:00:15] Train your whole team for less than $500. Find out more information, and get immediate access to your first free lesson at brighthillgroup.com/helpinggeeks. That’s brighthillgroup.com/helpinggeeks. [00:01:33] Welcome to the Becoming a Geek Leader podcast. My name is Tom Cooper. As a geek, I’m on a mission to figure out better ways to lead others at work, and at home. [00:01:43] Through the Becoming a Geek Leader podcast, I’m sharing what I’m learning, so I can help make you more effective at leading people too. [00:01:55] Have you ever had mud splash up on the windshield of your car while you’re driving? 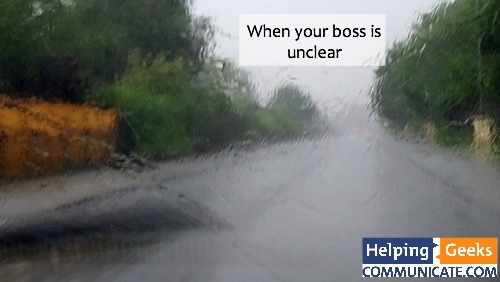 If so, you know that while the wipers are working to remove that mud, your windshield can get pretty blurry. Today, I’m going to talk about how to live clearly in a blurry world. First, we’re going to talk about the top complaints from employees about leaders who don’t communicate. [00:02:20] Then we’re going to talk about what do you do when you’re boss is not clear in what he’s asking you to do. And finally today we’re going to talk about how do you get clarity about high level estimates when project requirements are really fuzzy. [00:02:37] So let’s jump right into the thought leaders segment. Tom: [00:02:59] In a recent Harvard business review article called The Top Complaints From Employees About Their Leaders, I came across some stats that blew me away. First, they said that 91% of employees, 91% say communication issues can drag the executives down. Since this podcast is all about helping you become a better leader, I’m going to share the results of the survey and talk about how you can respond. [00:03:26] This article is targeted at executive communication. Communication when you’re the boss is something you need to think about when you’re at level three of the four levels of thinking as a geek leader. But even if you’re not a boss yet, listen to see how these things affect you. You can find a download of the four levels of thinking as a geek leader on the webpage for this episode. [00:03:51] Level three. As the boss of a team, your job is to recruit and develop individuals, and team members who follow your lead. Tom: [00:04:03] Let’s say that you’re not the boss yet, you can still think about how to apply these ideas so that you can avoid some of the challenges that these leaders are facing. So here they are from the least annoying complaint in the survey. Number nine, not asking about employees lives outside of work. 23% of employees complain their leaders only think about and talk about work. They don’t recognize that people have lives and interests other than work. Now even though this is the least annoying, know that this affects almost 25% of the people you work with. [00:04:41] So moving on from number nine to number eight. Refusing to talk to people on the phone, or in person. Now this leader is only using e-mail for all communication, as if that works. Oh my goodness. [00:04:45] number seven, not knowing team members names. Really, you don’t know the names of the people on your team? Dale Carnegie said ” The sweetest sound of any language is the sound of a man’s own name.” And it’s a good idea for you to know the names of your team members. [00:05:13] Number six. Not offering constructive criticism. Now I want to point out that some people don’t like to tell others when things are not going well, but I’ll tell you that people really do want to hear negative feedback, and they don’t want to hear you criticize them personally or attack their character, but they do want to know that what they’re doing doesn’t need the standard. So the thing is when you refuse to give direct and clear feedback about negative performance, you’re not actually helping them, and I see this all the time. You’re really cheating them out of getting the information they need, and on top of that you’re selfishly avoiding a difficult conversation. Ouch, don’t do that. [00:05:55] Number five. Taking credit for other people’s ideas. Man you’ve got to be kidding me. Real leaders share the credit, and don’t share the blame. Number four, refusing to talk to subordinates. Now I hear this all the time, I was just talking to a CFO yesterday where he was complaining that his boss wouldn’t talk to him. Make the time to talk to people. It pays. [00:06:20] Number three, this is related to number four. Not making time to meet with your employees. Look if you’re the boss, at a minimum you should schedule a 30 minute one on one meeting at least every other week with your team members. How are you going to connect with them personally, how are you going to help them feel heard if you don’t do that. [00:06:38] Number two. Not giving clear directions. You should, when you’re giving clear directions you should be able to ask them to repeat back in their own words what they heard. It’s surprising how different what you said is from what they heard, and most people are far less clear than they’d think. And we’ll talk about that some more in just a minute. [00:06:59] And the number one issue which was raised by 63% of respondents was not recognizing employee achievements. Now I’m going to emphasize that even if you’re not the boss, you can start practicing every item on this list. And no matter where you are on the four levels, whether you’re an individual performer, or a team member, or a team leader, or a team builder, tackling these communication challenges is a big deal. And it’ll help significantly. [00:07:30] People on your teams, whether you’re the boss or not, they want to feel connected, they want to feel heard, and they want clear messages from you. Make communicating your priority, and you’ll be surprised by how much of a difference it makes. Now I’ll put a link to the article on the show notes, the original article from Harvard Business Review on the webpage for this episode. And by the way, Harvard Business Review has great articles, and you might enjoy their podcast too. They call their podcast the Harvard idea cast, The Harvard Business Review idea cast. Check it out. [00:08:00] and that’s today’s thought leader segment. Tom: [00:08:21] For today’s mentoring segment, I want to talk about what can you do when you’re on the other side. When you’re the one trying to get a message from a boss who’s completely unclear. Years ago I worked in a company where one of the leaders was frequently very frustrated with his team members. One time he was exasperated, he said ” I was crystal clear with them, why didn’t he get it? ” I’d been on the receiving end of a number of those messages, let me assure you that crystal and clarity did not enter into the conversation. [00:08:55] George Bernard Shaw said ” The single biggest problem with communication is the illusion that it has taken place. ” And in this situation he definitely had the illusion that communication had taken place. I spoke yesterday with the CFO of a company, and he remarked that his boss was guilty of many of the top complaints employees have about their leaders, and communication, and he told me he couldn’t even get a response from his boss who was the owner of the company. And he struggled to get good insight from his boss when he did get feedback. So I know this is a problem. I even went back, and looked over my notes from coaching sessions with clients, and unclear IA a word that appears dozens and dozens of times in my notes. It’s one of the top problems my clients face. [00:09:41] Today, I’ve got two ideas to share with you. Both of them are things I think you should start doing at level one of the four levels of thinking as a geek leader. At level one you may even be a superstar technical resource. Level one focuses you on improving your technical skills. Tom: [00:10:05] So what can you do when your boss is unclear? And we know it’s impossible to change the other guy, we know that because it’s so difficult for us to change ourselves that we can know that we want to lose weight, and so we need to eat better, and we need to eat less, and we need to exercise more. We can know that, But it’s not easy to do that. [00:10:29] So if we have so much difficulty on changing ourselves, it’s really almost impossible for us to change the other guy. So you can’t make your boss become a good communicator, but there are two easy things you can do. First, when you’re uncertain about what your boss wants, ask him or her to clarify. Ask them to give you a better picture. Now I’m a big picture guy, and I think in concepts, not in details, I tend to communicate a really high level, and I really love it when people can fill in the gaps. [00:11:04] But I remember that I used to work with a team of detail guys, people who wanted to know every part that I wanted, and how I wanted it done too. Specifically I remember working with Julio, Julio was a talented developer who was very detail focused, and he was very quality focused. He wanted to get it right. You might imagine that Julio and I were not always on the same page. When I was delegating work to him, or assigning a new project to him, Julio insisted in going over all the details with me. I’ve got to confess when I was pretty frustrated about doing that, because in my head I was thinking ” It can’ t be that hard. Why can’t you just run with the ball. ” But one thing I learned from Julio’s questions is that I was not as nearly as clear as I thought I was. [00:11:54] Another thing that Julio taught me that there were sometimes that I wasn’t even sure yet exactly what I wanted, and that my idea needed more work before it was ready to be handed off for somebody to actually do some work about it. And another thing that Julio taught me that the time invested with him on the front end of the process was very well spent, because once he had a clear understanding of exactly what I wanted, he was so much more effective in delivering exactly what I wanted. So if you’re not clear about what’s needed, ask, ask for clarification. Make sure you understand exactly what the boss needs, by when and with what quality level. [00:12:39] Charles Blair said “Have an understanding, so there won’t be a misunderstanding.” If you aren’t sure what your boss wants, ask. Let me give an example. Let’s say your boss comes to you and says ” Are you done on the Rappel hammer project, I need you to finish that up. ” Now not knowing exactly what your boss wants you might say ” Boss, I’m not sure exactly I’m clear on what you mean by done. So you mean done with adding new features? Or done ready to launch the customers? Or somewhere in between? ” Your boss would much rather be frustrated by your questions than be frustrated by your lack on delivery, because you worked on something other than what he wanted, or what he intended. [00:14:15] Your boss gave you a very general assignment, and you repeated back what the boss wanted, and then you asked for clarification by kind of putting in some specific hints, and details. And the thing is your boss might not know that Pash and Sheila haven’t really thought through exactly what they want yet, but here you are giving him that additional information in your repeating back, and you’ve defined a measurement, I’m going to give you a list by the end of next week, and now you’ve identified some really specific things that need to be done. You can also follow up with an email, summarizing the assignment as you understood it. ” Hey boss, after our conversation I’m just sending this email to confirm that I’ll get back to you by the end of next week with the list of requirements I get from my meetings with Pash, and Sheila. ” See that way you’re on the same page, and you’re not going to be having a fight, or an argument later. [00:15:18] Another example, your boss might say “I need you to take care of that problem Joe called me about. You know, the one where labels are all printing wrong. “So you repeat back, you say ” You want me to meet with Joe to find out what changes are needed for the labels.” And in this case the boss might give you come more information ” Yeah, and then I want you do to whatever else is needed to solve it. So at this point you can respond ” Okay, so I’m going to meet with Joe, find out what changes are needed, and then move forward with making those changes.” At this point your boss will probably look at you, and say something like “are you still here? Yes, that’s what I want. Is it done yet? “Okay, I work for that guy, I might have even been that guy. So repeating back is a great way to make sure that you, and your boss are on the same page, and you have the opportunity to offer some specifics about how much, and by when you’re going to be doing that delivery of the things that he’s asked for. [00:16:15] So the two things that we talked about today are ask for clarification, and repeat back what your boss has asked for. And that’s today’s mentoring segment. Tom: [00:16:58] In the coach’s mailbox segment, today I’ve got an e-mail from Liz. She writes ” Tom, I’ve been asked to come up with a plan for a new project. But it’s in an area where we don’t have a whole lot of experience, and the requirements are not clear. I’ve asked some technical team members for estimates, but it has been really hard. They want me to give them a ton of details about the technical requirements, those just don’t exist. But my boss is really all over me to give him an estimate of what it’s going to take to do this project. How in the world can I get good estimates when the requirements are not well defined? Is it impossible? I mean that’s what the tech folks are telling me. ” Well Liz, this is a challenge. There’s no question about that, and I’ll tell you we could spend hours literally digging into this topic. But for today, let me share how T-shirt can lead to better estimates. [00:17:54] Now in order to tackle this, you need to be thinking of level two of the four levels of thinking as a geek leader. [00:18:04] Level two is where you work well with others. And together, you all succeed. Tom: [00:18:10] I’ve spend a lot of years working as a technical team member, and somebody who was actually hands on the keyboard doing technical work, and I can tell you when I was a technical team member, I loved to have small scope, and clear requirements. And early in our careers that was the kind of assignments we always got that was very clear, very specific. I remember being in school, and I got really clear work assignments in school like that, here write this algorithm, it solves this particular thing. [00:18:37] But now later in my career, later in your career. Now that we’re leading work efforts, things are less clear. In fact, I’ve got some bad news. The higher you go in your role, the less clear things become. One of the critical skills in becoming a geek leader is managing ambiguous requirements, and unclear goals. It’s your job to help make those goals, and requirements clear for others. It’s your job to find a fuzzy stuff, and help make it sharper. [00:19:14] Now a lot has been written about estimation techniques like pert and parametric estimating, an analogous estimating. And depending on the data they you’ve got available, it maybe very helpful to use one of more of those tools. But the challenge that I found while I was trying to use any of those types of tools is that the tools assume that a, you know exactly what you want when you’re done, and b, you’ve data available that’s going to support you in that analysis, and my guess from that e-mail is that you have neither or not much of either. So let’s talk about what you can do to come up with a good big picture estimate. [00:20:31] So as you work with your technical leads, you identify the major work area, and then whatever teams are needed to be involved in, in collaborating, or performing the work. And then tell them “Look, I’m just looking for a T-shirt size. Tell me is it large, medium, or small? I want to know how much effort? Not when, not duration, I just want to know how much effort this is going to be. How hard will it be to complete the work? Not when is it going to be done, or how is it going to be done, but how hard is it to kind of get those results. “Now I’ll tell you this can be a big challenge especially with folks who are high quants, who want to get everything measured down to perfection. And the less specifics you have, the less comfortable they’re going to be with answering your question. And it’s not because they don’t trust you, it’s because they don’t know for sure exactly what you want, and more than anything else that has been my experience that technical folks hate to be wrong. [00:21:36] so how do you manage that? What you can do to help with their concern about being held accountable is something that’s really vague is to document for each major result, or milestone as you’re working with them either on paper, or on a whiteboard, write down here are the assumptions we are making. So for example, number one scope of this part of the project is limited to X. If that changes it might change, but the assumption you’re making for this estimate is that the scope is limited to X. Number two, we assume that Y, and Z will both be available when we start our part of the work, and number three, we only have to hand off A, and B when we’re done with our part of the work. And what this process does is it helps them be more confident, because they’re limiting their commitment to the constraints, or the assumptions that you’ve put out there. So if any of the assumptions change, their estimate is going to change, and you can tell them that if any of these assumptions turn out to not be true, we’ll come back, and get a better estimate. And then your goal is to help them identify small, medium, or large T-shirt size for each milestone. Once you’ve got small, medium, or large identified then you want to ask them based on what you know today, from this conversation only how comfortable are you with a T-shirt size we’ve talked about. [00:23:05] So for example, we talked about meeting enterprise security standards, and tying that in with the enterprise single sign on toolkit that you told me that was a small T-shirt. How comfortable are you with that size based on what we know today? Would you say your comfort level is high, medium, or low? Now we’re talking broad strokes here, you might get pushed back like “I don’t know, how much are you planning to change the scope? So when do you want to get this done?” You want to reassure them, you’re going to limit the discussion to the things we know today, and we’re going to assume the scope is limited only to that. [00:23:38] Now it may take going over a few major deliverable in this manner with them, but using this technique you should be able to get a sense of A, how much work it’s going to take? B, how risky the project is? And C, where the team is the least confident about executing? Now with this knowledge you can compare the project as it’s now defined, and look at the risks associate with it, and establish how much effort, and cost, and time it’s going to take to deliver. [00:24:09] Now I’ll tell you it’s always, always worth it to consider a more lean, or an agile approach, but I know from experience most organizations still complete budget planning for projects in a more waterfall model, so it’s helpful to use this exercise to get a back of the envelope or T-shirt size estimate when the requirements are still mostly undefined. Liz I hope this helps you with your estimates. And that’s today’s coach’s mailbox segment. Tom: [00:24:57] So in today’s episode, we talked about top complaints about leaders who struggle to communicate. We covered two ways to get clarity when your boss is unclear, and we talked about getting better estimates using T-shirts. [00:25:12] For today’s episode hack, I want to encourage you to get more clear messages from your boss. If your boss is asking you to do something, and you’re not crystal clear about what he wants, ask. Ask for clarification. If your boss is asking for something that’s a little squishy, repeat back what he asked, and then make it more measurable. Tell him, when you’ll get it done, and exactly what you think he wants from you. If he buys in, you’re going to know you’re on the right track, and if not at least you’re clear about that too. You get that conversation going which is really what you need. And that’s today’s episode hack. [00:25:48] Hey, Can I ask you something? Did you hear something helpful on today’s episode? Why not share it with a friend? On my iPhone, it’s as simple as hitting the three little dots on the bottom right of the screen, selecting share episode, enter your friends’ e-mail, and hit send. Why do this? Two reasons. One your friends or coworker will thank you, you’ll be seen as a source of helpful, and valuable information, and they’ll appreciate you for it. And number two, I need you to help me get the word out about this podcast. I’m working hard to bring great ideas, and great content to you, but it’s a big help to me if more people hear those ideas. Go ahead, share it now. I’ll wait. [00:26:39] This is Tom Cooper, thanks for listening. Be sure to join me next time for another episode of Becoming a Geek Leader. Join me in my mission to discovering better ways to lead others at work and at home.